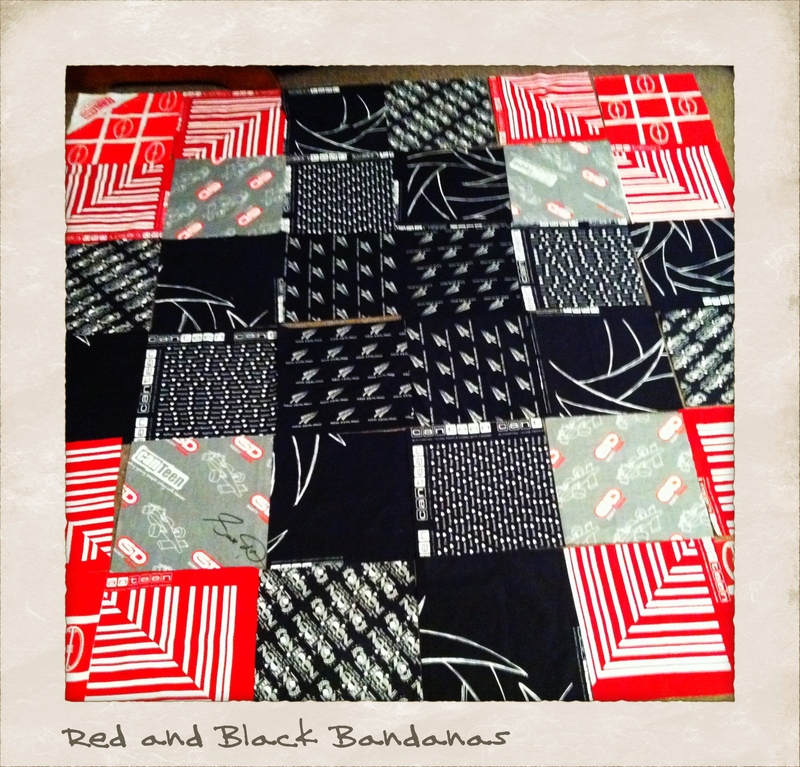 We spent yesterday working on a red and black quilt. This one has Dan Carter bandanas and lots of silver ferns. Red hearts in the corners. Funny little chickadees, my class – they wanted to make this quilt because of something that happened last year. It was a normal Thursday morning and we were all busy with sewing when we heard that ominous, deep-throated rumble. Without hesitation or consultation, 16 people threw themselves into the turtle position under my big sturdy sewing tables. We held our collective breath as the rumbling got louder… and then a little digger trundled past the windows. You would think we’d be relieved but it surprised even me that the overwhelming reaction was anger. Curled up in little balls under my tables, half the class burst into tears. “I’m sick of being afraid, ” one of them yells. It’s horrible, it’s heart-breaking and it’s hard to be the strong adult when I mostly feel the same way they do. Fear has embedded itself deeply within our psyche. I have a stack of blankets in my room which we cut up for cushions and use for quilt backs. I reach out and drag them under the table, pass them around for the kids to tuck up under. We stay in our table cave for a little bit longer and I just let them talk. My poor little turtles, they’re so weary. And so good at putting on a brave face most of the time. We have a Harry Potter moment and name that which we are afraid of. Damn Earthquake we all shout. Then smiles, even a few giggles. We crawl back out, settle at the machines and carry on with the winter beanies. Yesterday we commemorated February 22 as a school. We stood quietly as a brave, brave little boy talked about his lost mother. She was alive for at least 12 hours in the rubble of the CTV building before her cell phone battery died and they didn’t hear from her again. We wept together, as a school. And my class, knowing the restorative power of creating, spent the day making him a Canterbury quilt with a cross in the middle for hope, red hearts in the corner and as much love as little 12 year old souls could stitch into those red and black seams. This brought tears to my eyes but nothing compared to the tears you must all have shed and I cannot begin to imagine how it is to live with the daily stress and the loss and grief. Thinking of you all. What a wonderful class you have and that quilt….so, so lovely and so, so meaningful. I’m really lucky that I can offer them a way of dealing with the grief – there is always someone worse off than you and you can always make them something to let them know you’re thinking of them. I used to have trouble getting my students to ever sew anything for someone other than themselves – but not last year. reading this made me weepy too– such a bittersweet story. I’m glad those 12 year olds have you– and that you, in return, have them. what a beautiful quilt, made with so very much love. Thanks Lisa, they keep me going that’s for sure. It’s been a year of doing small things with great love. Yes, tears in my eyes too. So much loss and sadness, and trauma. The trauma part being the hardest because when the first two fade, the last one brings it all freshly and sharply back. Thanks for sharing, it’s all part of the human face, and not something that gets shared much in blog world where the social construct demands relentless cheerfulness and the facade of unsullied wholesomeness. It’s why I didn’t post much over the last year… things were very un-cheerful in this part of the world and a lot of people just don’t want to hear about it anymore. But some stories need to be told and there is a lot of love in my school at the moment. Thanks for your support, it means a lot. This is so touching, I found myself crying as I read it. I’m so sad for that boy and all the others like him who lost someone that day. It’s a wonderful thing for those students to have an outlet (like making a quilt) to express their concern for him, and to put something of themselves into a gift. There are so many kids at school who have lost so much and yet they keep turning up, day after day. So resilient, so brave. I’m in awe daily, I tell you. Actually, what we’re sick of hearing is the “official” versions and media “truth”. Your stories have far more value and probably need to be shared. Think of you often; continuing to pray that you stay safe. Thanks Kathryn. We think we’re doing really well, trying to forget about it, then Tim will see himself on tv as they show another never-seen-before shot from a documentary about those first awful days and it all comes back. It’s been really quiet lately… let’s hope it stays that way. I was thinking about you guys yesterday when I watched the news. It was an emotional day for all Cantabrians and for New Zealanders. Sadness, tears and memories for those that have lost loved ones, friends, colleagues and neighbours. Reading your post brought tears to my eyes. It’s so hard to imagine the stress and fear you all must go through on a weekly basis. Know that I think often of you down there. Thanks Deb, it helps to know that people understand it’s not over and probably won’t be for years. And you know how restorative quilting can be 🙂 Now my class knows too.